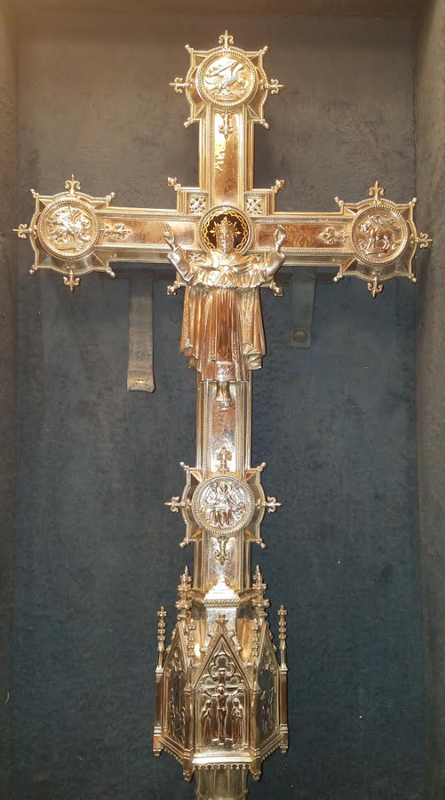 Our ceremonial processional cross was given by Mrs. Frank T. Redwood (Mary Buchanan Coale, 1861–1940), who was a member of Mount Calvary. The family lived at 918 Madison Avenue near the church. The father, Frank Redwood, was killed on Thanksgiving Day 1906 in a railway accident. George Buchanan Redwood, Mrs. Redwood’s first child, was born in 1888. His family had a long military tradition and as a boy was fascinated by soldiers. He attended the Hill School in Pennsylvania and graduated from Harvard in 1910. For a while he considered the ministry while he was working as a reporter for the Baltimore News. George attended military camp in 1915 and 1916 and after the U. S. entered the war was commissioned a lieutenant and served as a scout. He enjoyed tricking the Germans. He would go through No Man’s Land at night and visit occupied towns, where darkness and his flawless German enabled him to pick up useful intelligence. He would also pick up food and wine from under the Germans’ noses to bring back to his platoon. He would write his reports and include a joke and a line of verse. Men who went on patrols with him have told me that after leaving the trench and entering No Man’s Land, he always knelt in a shell hole and prayed, and he was always careful not to expose them needlessly in dangerous positions. He always regarded his men. As to himself, he always sought the place of greatest danger…Lieutenant Redwood seems to have been the incarnation of the Christian soldier. During the German offence at Castigny, May 28, 1918, Redwood found the severely wounded Sgt. Max Rosenbaum, who later wrote that Redwood “administered first aid to me, and regardless of his own safety, he carried me back thru intense machine gun fire and intense artillery fire to the back area. While assisting me he was severely wounded, and instead of receiving first aid treatment as I asked him too, he attempted to reach the lines again” to carry out his scouting assignment. 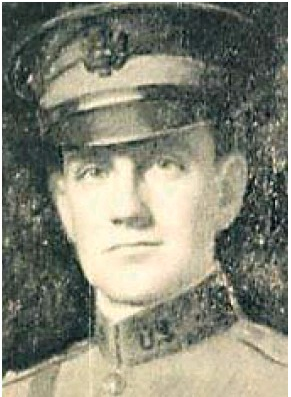 But a shell found him, and his platoon found his body with “a hole above his right temple and a piece of shrapnel through his heart.” He was the first Maryland officer to die in the war. His platoon carried Redwood to a quarry near Castigny and buried him. One was killed while digging the grave. They placed a propeller from a downed German plane as a cross. A CRUSADER BLAMELESS AND WITHOUT FEAR. His brother, Frank Jr., (1904—1923) learned that the girl he loved was engaged to his best friend, who was away at Harvard. He went to his friend’s house, to his friend’s room, took his friend’s pistol, and shot himself through the head. The Lord loveth whom he chasteneth, we are told, but all who know this heroic and lovely woman will find it difficult to understand why this culminating affliction should have come upon her. If there be tears in Heaven, angels themselves might weep for her. Certainly hundreds of mothers will weep with and her for her today. Human speech can compass no words of consolation for such a case as this. The pathos of it paralyzes the tongue and pen. If there is a God of mercy, as we believe there is, may He give her strength and courage to bear this last and most cruel cross of all. 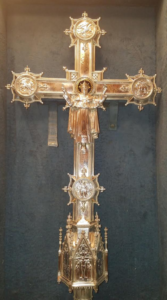 Her faith was unshaken, and she gave a silver processional cross to Mount Calvary, where her son had been baptized and confirmed and received his Lord in the Eucharist, as a memorial to her son and to his sacrifice. The story of George Redwood’s life and death is told in James Carl Nelson’s book, Five Lieutenants: The Heartbreaking Story of Five Harvard Men Who Led America to Victory in World War I.